Ultra Instinct Goku faces off against Jiren once again in the final episodes of Dragon Ball Super. In the conclusion of the Tournament of Power, Goku masters Ultra Instinct and is finally able to dominate Jiren. This forces Jiren to increase his own power. Goku is almost defeat twice, but manages to survive. Jiren attacks Goku’s friends and family sitting on the bleachers. Goku becomes enraged, finally defeating Jiren. However, Goku collapses from the strain of using Ultra Instinct. will always live on in his memories even as he ceases to exist.” Frieza saves Goku, with the previous thought dead Android 17 revealing he survived. Jiren becomes exhausted as he fights Frieza and 17. Then Goku recovers and joins the fray. Goku, Frieza and 17 team up to fight Jiren together. Goku and Frieza overpower Jiren, knocking him off. Monkey D. Luffy and Charlotte Katakuri face off during the Whole Cake Island Arc in the Mirror World. This fight was a long one and largely saw Katakuri dominate Luffy. This is why the result of the match, Luffy’s win feels strange and unnecessary. One of One Piece’s most distinguish qualities is that the “main character” in this case Luffy doesn’t have to always win. Even in a later “fight” against Kiado, Luffy is easily defeated. So why did he win this fight? Some fans wrongly suggested that this was typical plot armor, it wasn’t. However, I agree Luffy should have taken the lost on this. Regardless, we see Luffy reach another level as he introduces us to another form, Gear Fourth: Snakeman. The fight might be too repetitive and the victory was the wrong one. Regardless, it’s worth your time. Meliodas is the “Sin of Wrath” of the Seven Deadly Sins, faces off against the Ten Commandments. I’ve hear about the manga Seven Deadly Sins and seen it promoted on Netflix, but I haven’t really decided to pick it up. This fight changed that. The title character Meliodas fights all ten of the commandments. Derieri, Drole, Estarossa, Fraudrin, Gloxinia, Grayroad, Melascula, Monspeet, Zeldris. Meliodas first fights Drole and Gloxinia. They put up a good fight, but Meliodas takes the upper hand. However, the other Commandments arrive and dynamics of the fight change. Meliodas is ganged up on and is ultimately he is killed by Estarossa. This is a bit of a remake from the Boruto movie. Naruto and Sasuke join forces to fight Momoshiki. After disrupting the Chunin Exams to kill Naruto when they try remove to the Nine-tails chakra. The fight is one of the best of the Boruto/Naruto series. The animation is spectacular, as Naruto and Sasuke combine their abilities to maximum effect. The two prove to be too much for the Otsutsuki clan member. 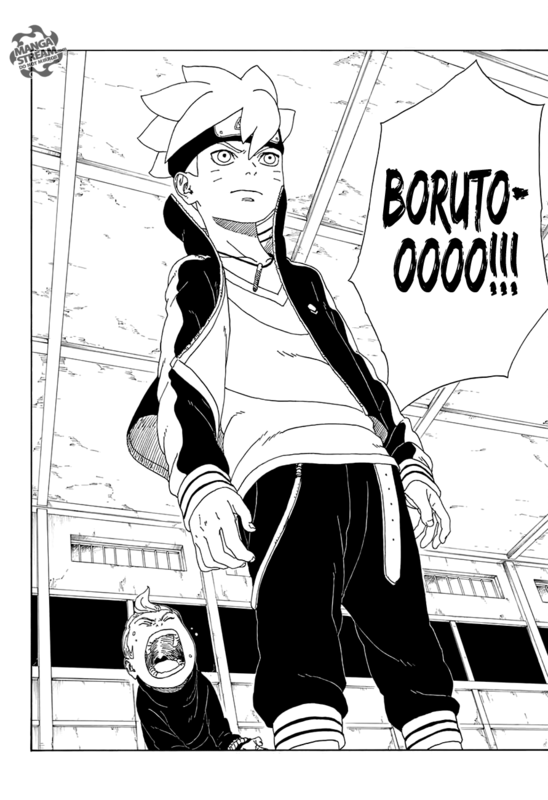 This being the Boruto series, it’s up to him to defeat Momoshiki. Using his own rasengan aided by his father chakra, Sasuke and his mysterious eye, Boruto ends Momoshiki, but it’s just the being of the new spin off series. It’s easily one of the best battles of the 2018 season. The finally fight of this list is the epic battle between old enemies, All Might and All for One. My Hero Academia featured many battles that could have ended up on this list but this one had no equal. When the League of Villains kidnap, Katsuki Bakugo, All Might is tasked with finding the taken student. During his rescue attempt he encounters his former nemesis. Backing the future of villainy, All for One aims to help them escape capture. He easily defeats the other top ten heroes, forcing All Might to engage. All Might is still weaken from their previous battle that left him with permanent damage. Still their fight is able to create massive shock-waves, destroying the surrounding area. All Might even reverts to his skinny form, revealing to the world that he’s not as he once was. Encouraged to fight for the future heroes, All Might gathers what remains of his dwindling strength and hits All for One with a devastatingly powerful move, United States of Smash. The most famous example is of course the Dragon Ball series. Goku in particular displays this troupe. You can often comically determine the point in the fight based on Goku’s clothing. If he’s still has his shirt on the fight cannot be over. Strangely enough his pants are apparently made of stronger fabric than his shirt. His pants may get torn, but they never get blow off like his shirt does. Piccolo, was an enemy of Goku until mutual respect for Goku’s fighting ability. Vegeta, prince of the Saiyan’s was nearly killed when he and Nappa tried to steal the dragon balls. Through the series Vegeta slowly becomes a permanent member of the Z team. Majin Buu, has about ten different forms. 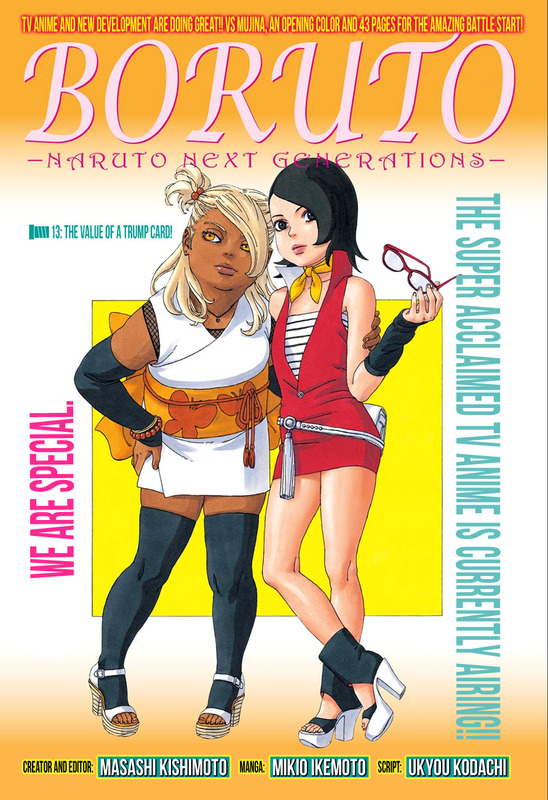 Fat Buu and Ubuu become members of the Z team. Android 17 & 18, both were created to kill Goku. 18 later marries Krillin, 17 actually doesn’t even meet Goku until Dragon Ball Super. 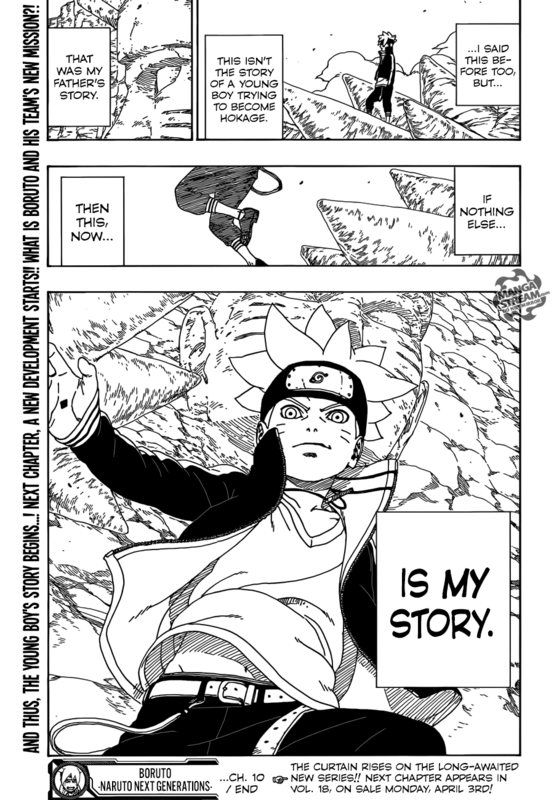 In Naruto, Neji and Gaara are transformed after Naruto defeats them and changes their lives. The problem with this troupe is that it’s unrealistic. For example, Piccolo, Vegeta, Buu, and Gaara kill many people and seemingly go unpunished for it, other than being defeated in combat. It is common in anime that a hero or villian will conclude that their opponent is too weak to be worthy of death. This is clearly design to keep the average skilled friends of the main character alive when the “main” bad guy decides that they don’t warrant being killed. It’s also a good way to display the power of a villian while not causing the lives of heroes. However, we all know that eventual the hero will surpass that villian. 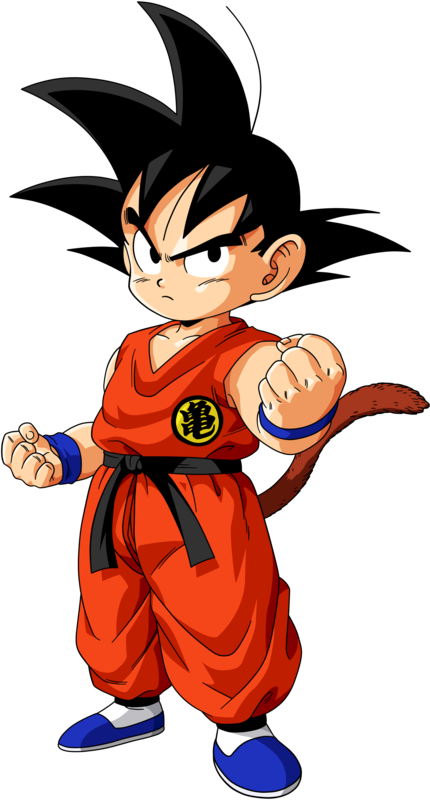 DBZ, Goku is notorious for leaving villains alive, hoping that they have “learned their lesson,” or even hoping that they comeback stronger because he loves the competition. He does this too often with Frieza, who then goes on to destroy the planet TWICE. He manages to kill everyone on Earth in “Resurrection F ” on for Whis to reverse it. Bleach, many of the fights in the series ends with the loser remaining alive due to being unworthy of death. 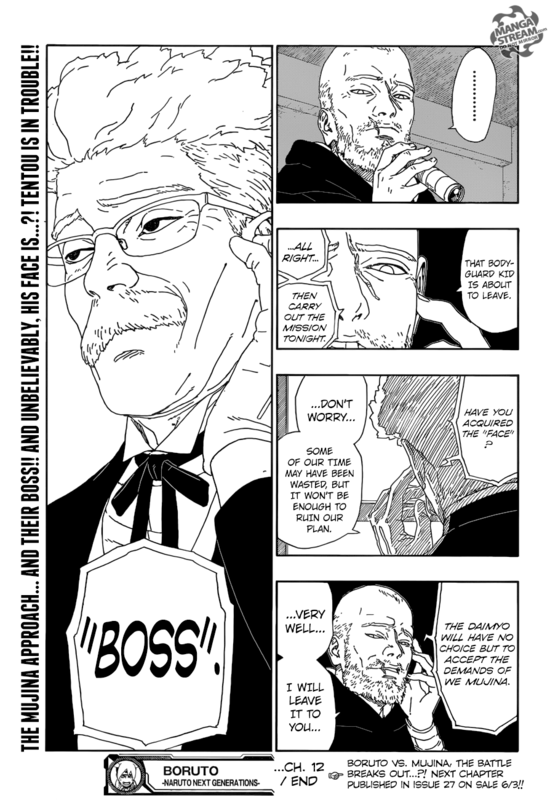 Kenpachi leaves Nnoitra after defeating him, he turns around to leave and Nnoitra attacks him forcing Kenpachi to finally kill him. 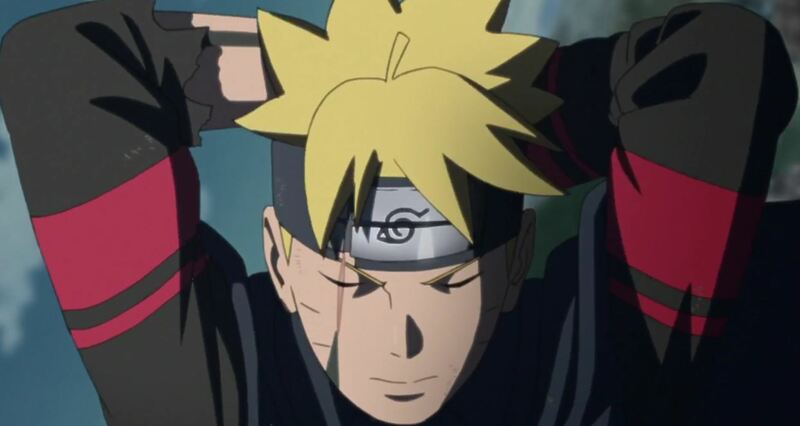 Boruto from Boruto is actually the opposite of his father, Naruto. 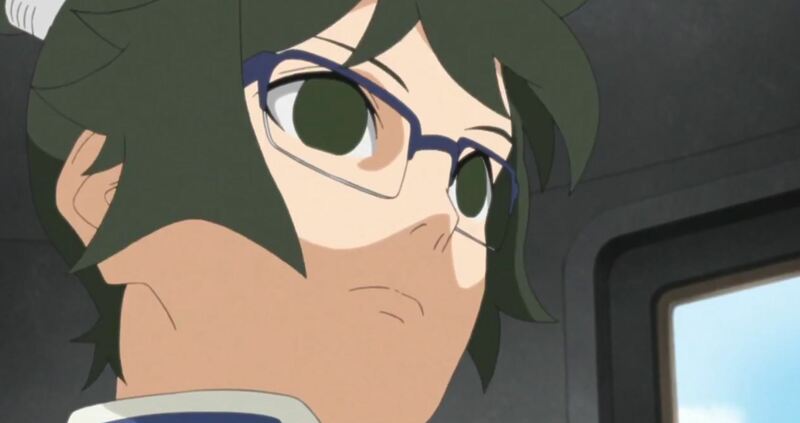 While he looks just like him, he’s actually considered to be a “genius,” and wants to be like Sasuke, sharing more qualities with him than his father. Saitama from One Punch Man also subverts this troupe, he does wear orange and trains a lot but because he became too powerful none of his fight thrill him and he’s now bald. Shigeo Kageyama from Mob Psycho 100, is average in many ways, he’s emotionally limited, hates to fight, his usual hair style is a bowl cut and wears all black. Izuku Midoriya from My Hero Academia, has a powerful quirk but his most important ability is his intelligence and ability to analyze and be strategic. Alright, this post is already too long. I could go on and on. There are many other troupe that bug me, but these are some of the most obvious. 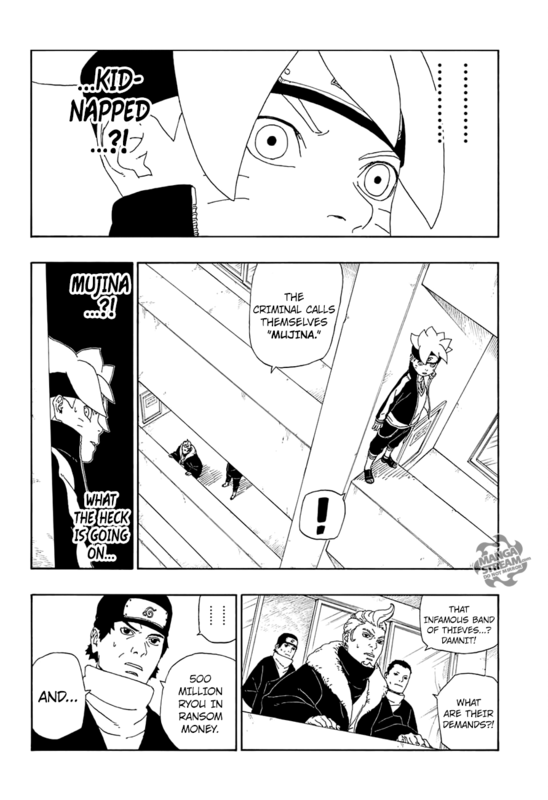 Compared to Naruto’s Akatsuki, the revealing of Kara was quick. 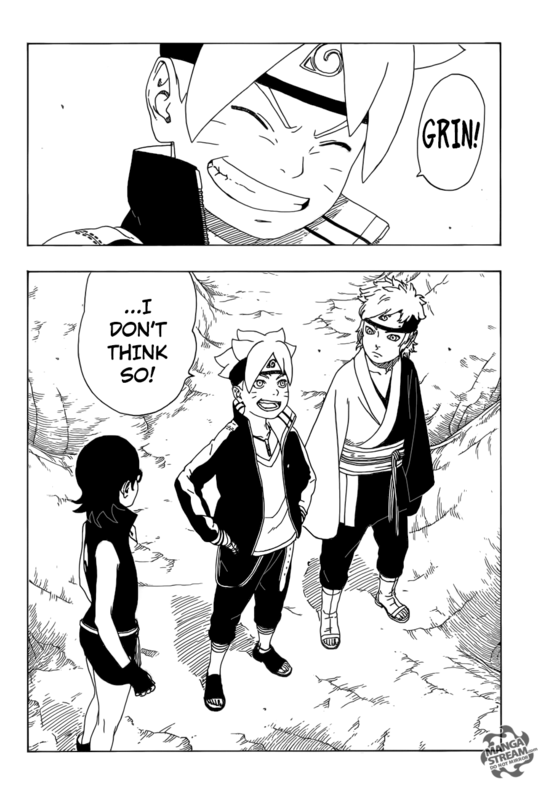 Boruto seems to be avoiding the slower burn of that series. However, none of the genin in Boruto seem strong enough to defeat any of them. I predict that this is just an introduction of Kara and they will disappear for a while as the genin gain enough strength to face them. 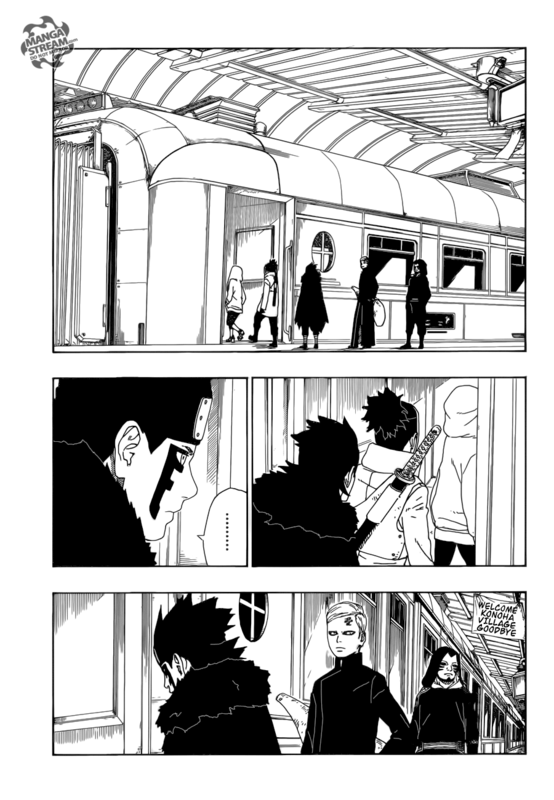 Naruto faces-off against Boruto in front of a crowd, Boruto starts of with several shadow clones, aimed to distract Naruto and get behind him. 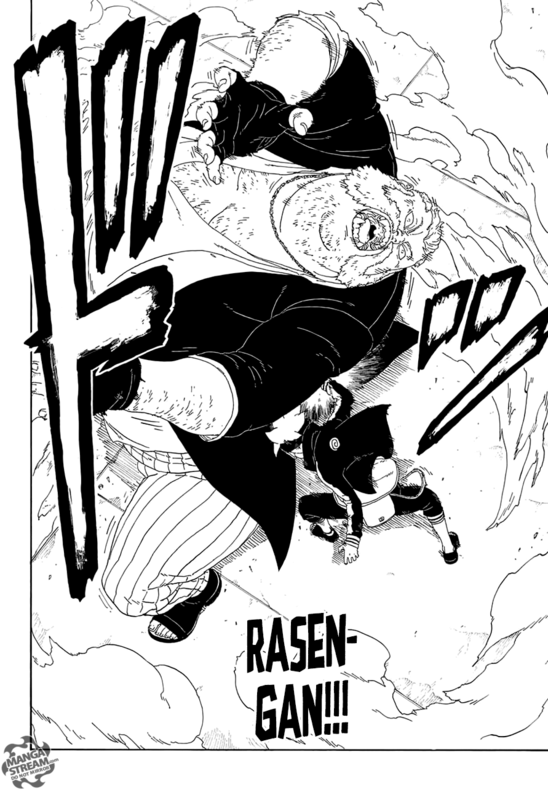 Boruto throws a rasengan at Naruto, it appears that he absorbs the rasengan. 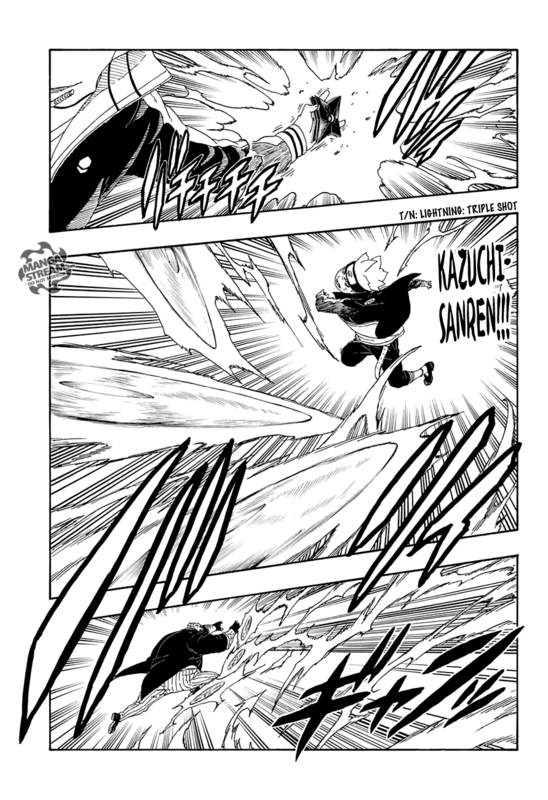 Boruto then uses, Water Style: Billowing Wave in combination with Thunderclap Arrow, Naruto responds by using Earth Style: Flowing earth wall, blocking his attack. Naruto then punches his fist through the wall and absorbs Boruto’s attack. He then appears behind Boruto without the hand, attacking Boruto, knocking him to the ground ending the duel. 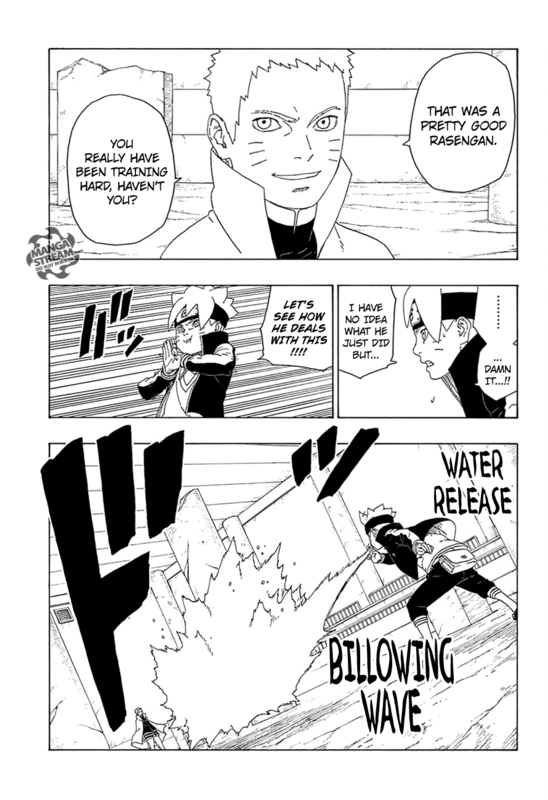 At the offices of the Hokage, Boruto berates Naruto for using ninja tech. 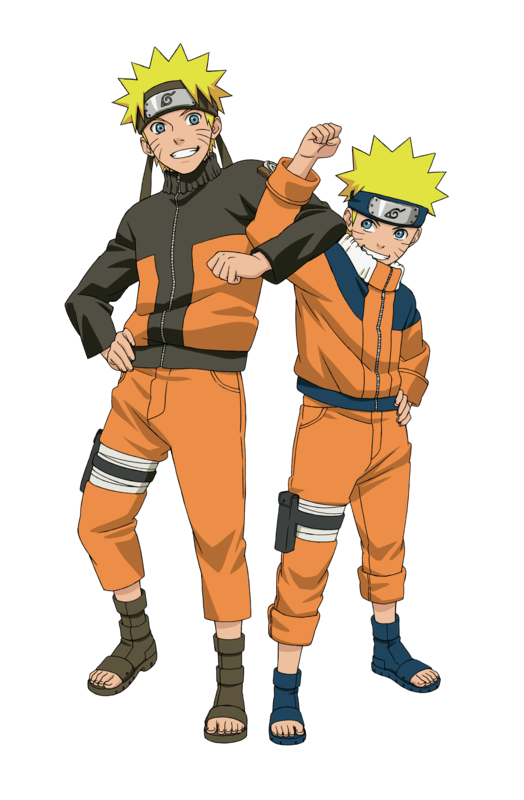 The tech is designed to emulate the ability of Ootsutsuki, absorbing attack, however, without the ability to release the jutsu. Sasuke states that it’s not cheating, and what matters is how you use the tech. 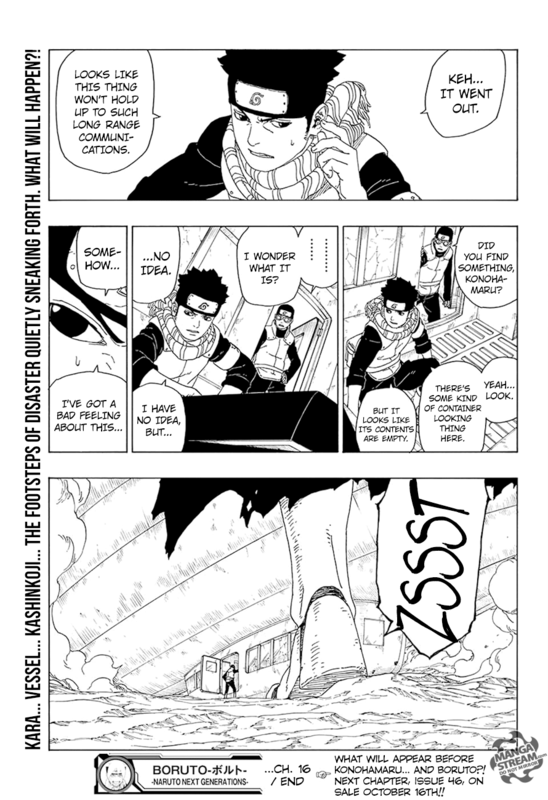 Finally, Konohamaru investigates a wreckage and is in danger from an unknown assailant. 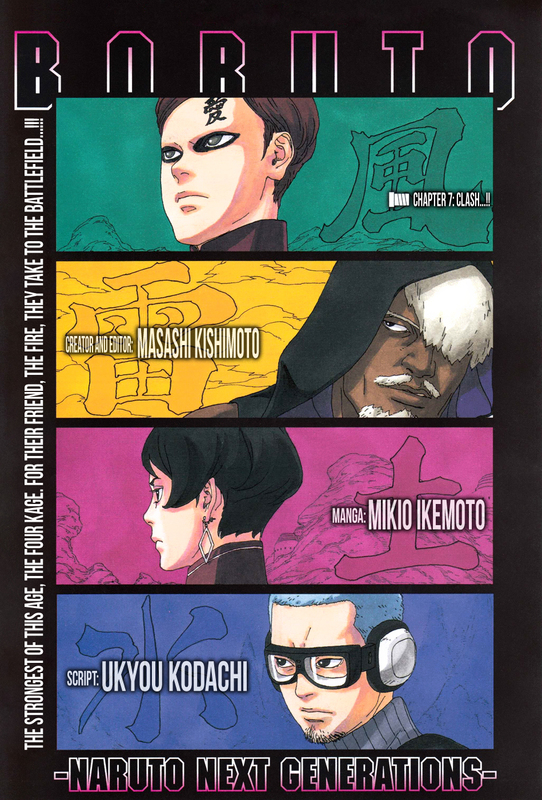 Boruto, chapter 10, My Story is the final chapter of the Momoshiki arc and I’m excited for the future of this series. 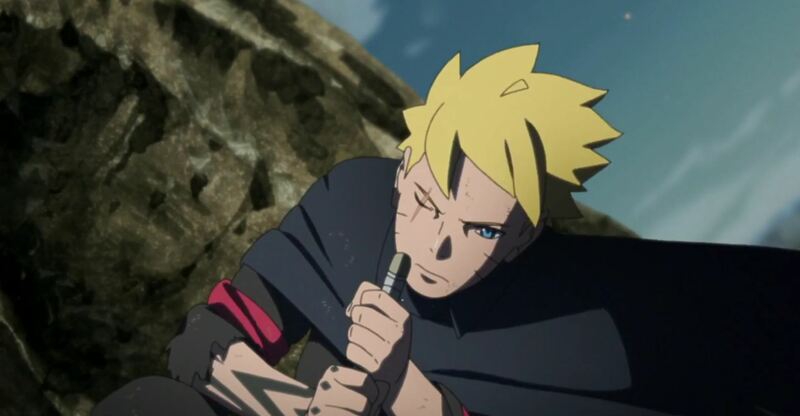 The Boruto anime will premiere April 5th. After Momoshiki defeat Boruto can still sense him, he appears above Boruto. 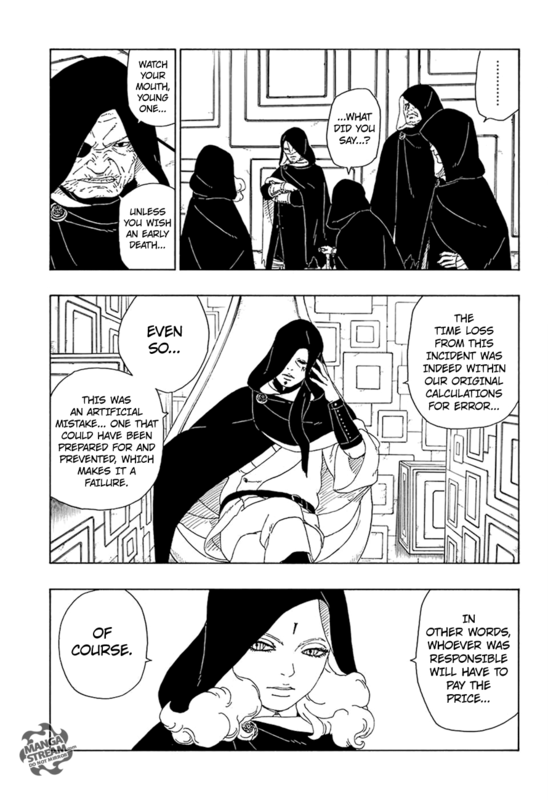 Momoshiki mentions that Boruto has Byakugan blood within him. 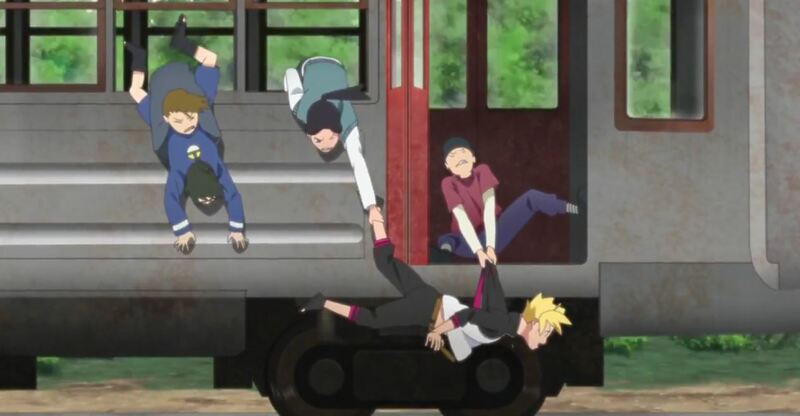 Boruto begins to panic, as he can no longer move. 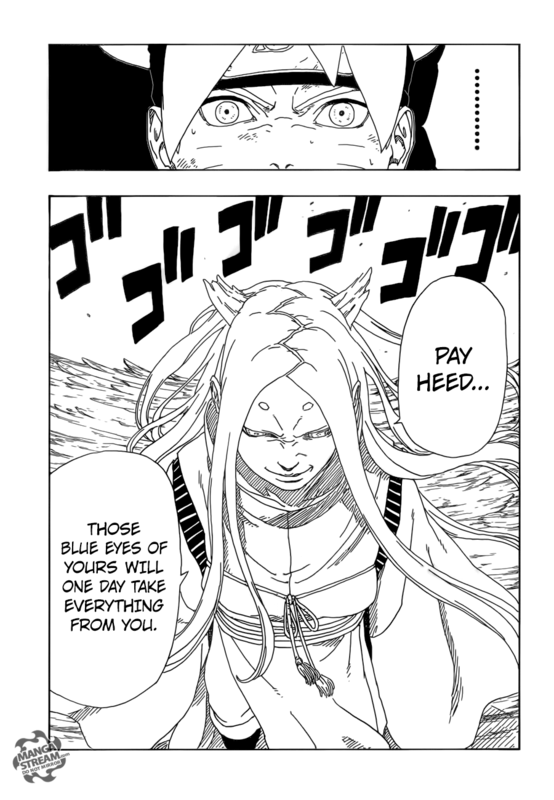 Momoshiki tells him that he can “see his fate clearly.” He tell hims that his “blue eyes . . . will be the take everything from him.” This is the most confusing part of this chapter, is Momoshiki still alive? What does Boruto’s eye have to do with anything? I assume it has something to do with the Byakugan and maybe Boruto’s potential new abilities. Team Moegi, Shikadai, Chocho, and Inojin are complain about having too many missions for a genin team. Shikadai is like his father was, lazy. Moegi tells them get back to work and the more the do, the more money they make. Meanwhile, Gaara, Kankuro, Shinki, Araya and Yodo discuss Boruto defeating Momoshiki. 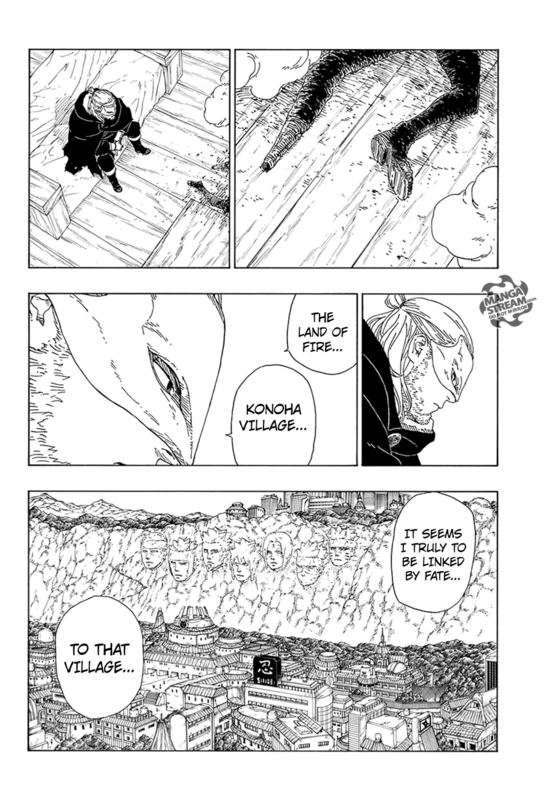 Shinki says that because Boruto is “reckless, foolish, and a low level ninja.” While, Gaara tries to explain that he is the reason Shinki didn’t fight, Shinki still believes that he wouldn’t be able to defeat Momoshiki. 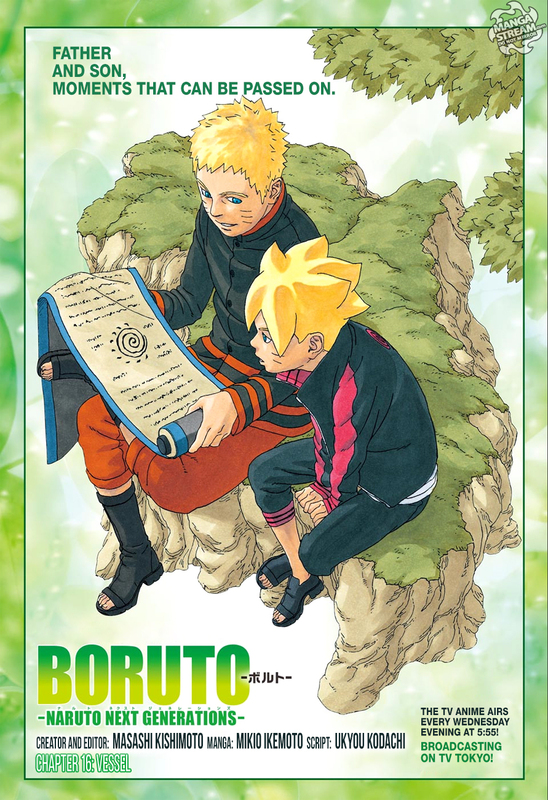 After the events of the arc, Naruto and Boruto seemed to developed a closer bond. Boruto is now famous after defeating Momoshiki, and his teammates admire him more. 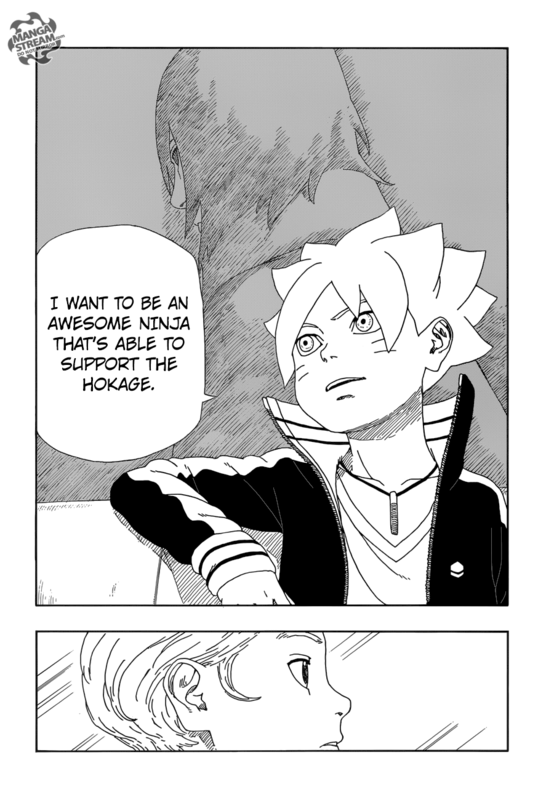 It is here that Boruto re-confirms that he doesn’t want to be Hokage, and will be the support system for Sarada. 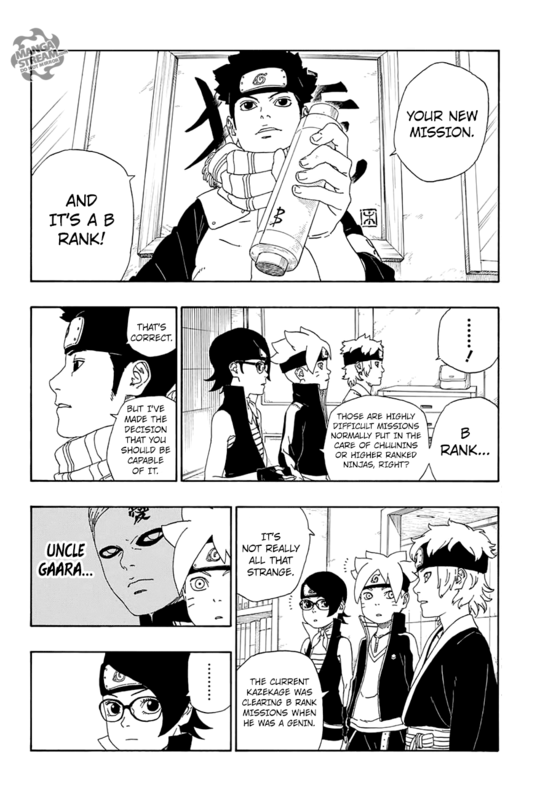 This is nothing new for this series so far, as Sarada aim to emulate Naruto and Boruto wants to follow in her father (Sasuke) footsteps. 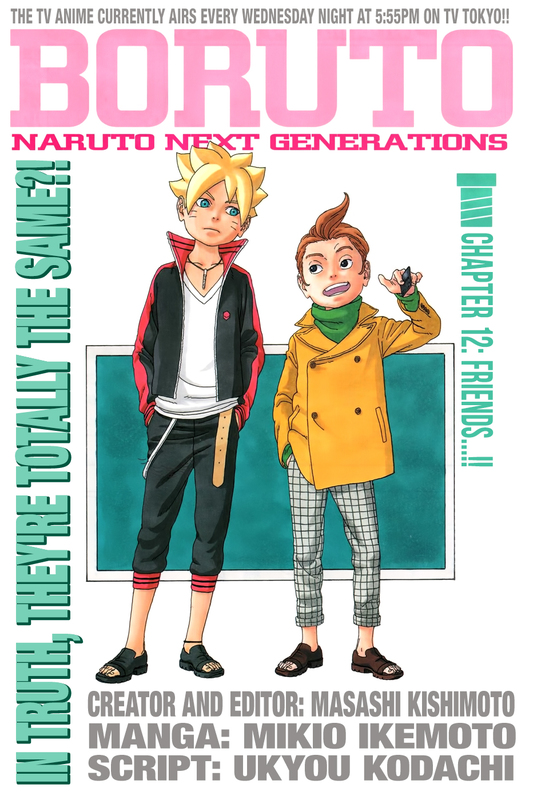 The series has moved pasted the initial introduction and the chuunin exam that the Naruto series took more than 100 chapters to accomplish in 10 chapters. 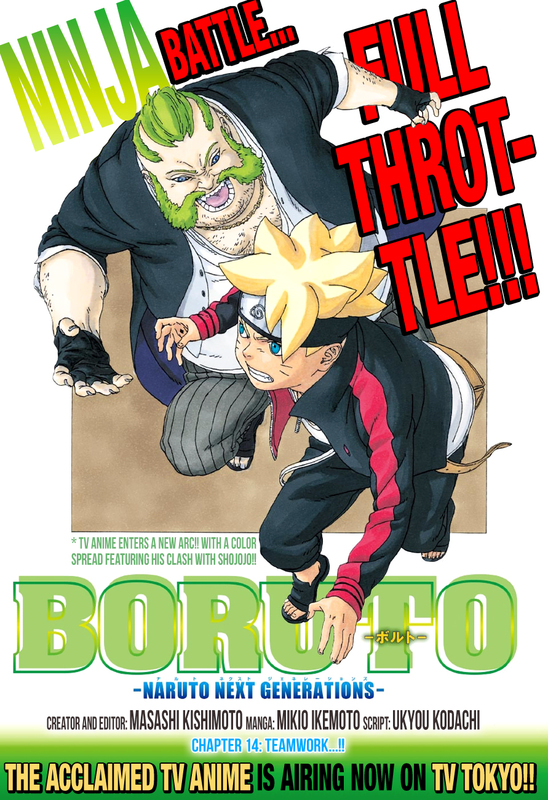 I’d imagine that the Boruto series will be shorter than Naruto, but not short. Regardless, I can’t wait for the next chapter April 3rd and the anime series. 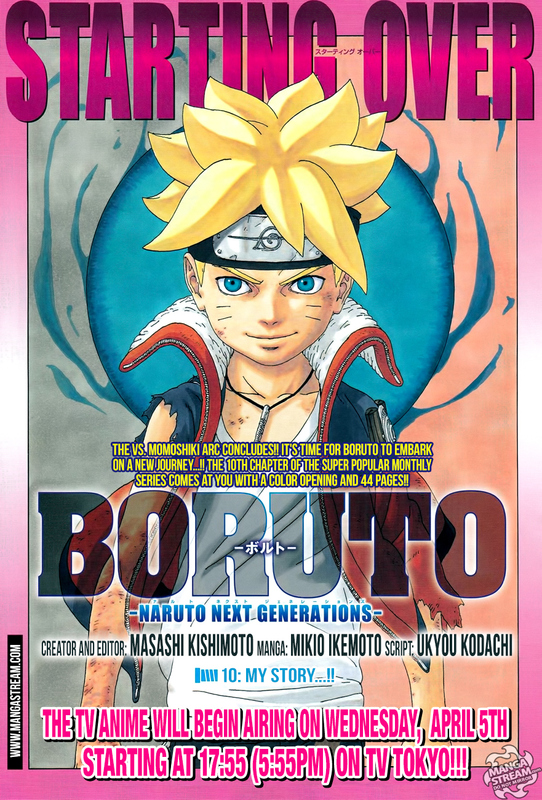 I have been critical of the Boruto manga series for several reasons, being a monthly, the art style and the rehashing of the Boruto movie. For the most part I have come to terms with the monthly schedule as I have other manga to read. The art work is getting much better and I have actually starting to like it. Finally, this chapter has departed slightly from the movie and added some small details. That said the chapter mostly regurgitates the movie, even down to the dialogue. The art in the chapter seems to have improved greatly, it’s possible that not having read a chapter in a month may be the reason. However, I feel that the perspective and proportion of the characters are much better. The details of the characters and the background are impressive. Finally, Momoshiki looks completely different from the movie and his design is great. I’m looking forward to what changes might come in future chapters of this series.